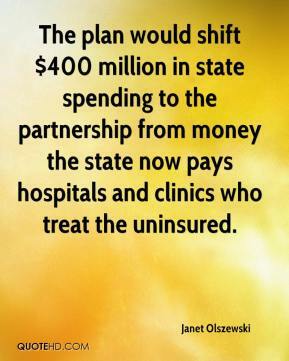 The plan would shift $400 million in state spending to the partnership from money the state now pays hospitals and clinics who treat the uninsured. 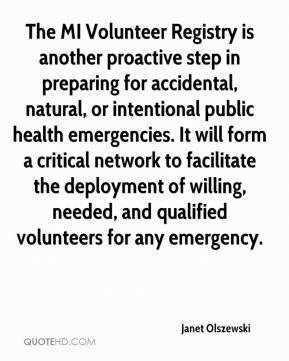 The MI Volunteer Registry is another proactive step in preparing for accidental, natural, or intentional public health emergencies. It will form a critical network to facilitate the deployment of willing, needed, and qualified volunteers for any emergency. 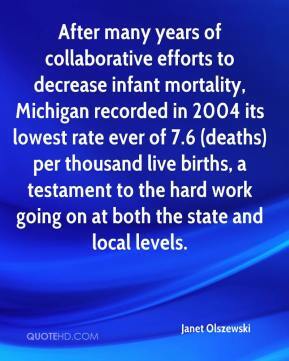 After many years of collaborative efforts to decrease infant mortality, Michigan recorded in 2004 its lowest rate ever of 7.6 (deaths) per thousand live births, a testament to the hard work going on at both the state and local levels.